Image caption Graham Linehan is also behind TV shows Black Books and IT Crowd. The co-creator of Father Ted has been given a verbal warning by police for alleged harassment following a row on Twitter with a transgender woman. 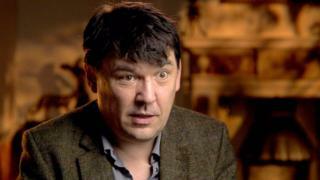 Graham Linehan was told by West Yorkshire Police not to contact Stephanie Hayden. She reported him for referring to her as a "he", and for tweeting the names she used before transitioning. Miss Hayden, 45, is now suing the writer. Mr Linehan, 50, told the BBC he is also considering taking action against her. The row comes amid a continuing debate about gender recognition in the UK. Currently, if someone wishes to have their gender identity legally recognised, they have to apply for a Gender Recognition Certificate - which requires a medical diagnosis. Some argue the medical element should be removed and say there should be a system of gender recognition based on self-identification. But not all agree, with some "gender critical" people believing the system could be abused by predatory men. Do trans rights affect women's rights? Mr Linehan - also known for writing Black Books and The IT Crowd - had given his backing to a support group of trans women who are opposed to self-identification and said he would back their campaign on social media. Miss Hayden was also a member of the group, saying she is also gender critical, but said she had never met Mr Linehan. An internal row saw the group disband, but led to a number of acrimonious tweets between Mr Linehan and Miss Hayden. This included the Irish writer retweeting a post giving her previous names with pictures, and Miss Hayden tweeting Companies House information which revealed Mr Linehan's home address. Miss Hayden, who is pursuing civil proceedings accusing him of harassment, defamation and misuse of private information, told the BBC: "I spoke to the police for 45 minutes about how I wanted to go forward. "I didn't think he was a physical threat, but thought if the police spoke to him and advised him with a warning, he would possibly realise the hurt he had caused. "The point I want to get across is this isn't about free speech, this is about harassment. "He is perfectly entitled to say his subjective opinions, but he is not allowed to publish details about me." Mr Linehan, who said he was speaking to his lawyer on Monday about possibly taking action against Miss Hayden, told the BBC: "The police phoned me and told me to stay away. "I would love to keep Stephanie away from me and my family and I have no intention of speaking to Stephanie. But he defended his stance of referring to Miss Hayden as "he", adding: "I will call all of my trans friends 'she'. "I think of them as women, they are respectful and are not misogynists. "But I refuse to respect the pronouns of misogynists."